Brussels Sprouts. To think I went 26 years of my life without them. Thankfully I sucked it up and roasted a pan of them 2 years ago…and then subsequently ate the entire pan in 2 days. These are one of my favorite winter vegetables. Roasted them in a no-fail way to win over non-believers. A friend of mine mentioned a shredded raw brussels sprout salad she made and it got me thinking that it was time to venture out. I wasn’t quite ready for raw sprouts, but shredded I could do. Then I found this delicious looking warm Brussels sprout salad over at a Beautiful Mess and I was sold. I made a few changes for what I had on hand and my personal taste. This recipe ends up being the best of winter with a touch of summer with the hint of lemon. Shred the Brussels Sprouts in a food processor. I chopped them, but think it would have been better if I had used the shredding function because the pieces were all different sizes. Heat 1tbsp olive oil in a large skillet over medium heat. Add the sprouts and toss with oil. Cook until bright green. Add craisins and cook for a few more minutes to warm them. Clean the food processor and then add the mayo, garlic, and lemon juice. Pulse until well combined. Leave the processor running and add 1/4 cup of olive oil. Add salt and pepper for your personal taste. Pour the dressing over the hot mixture. Coat well. 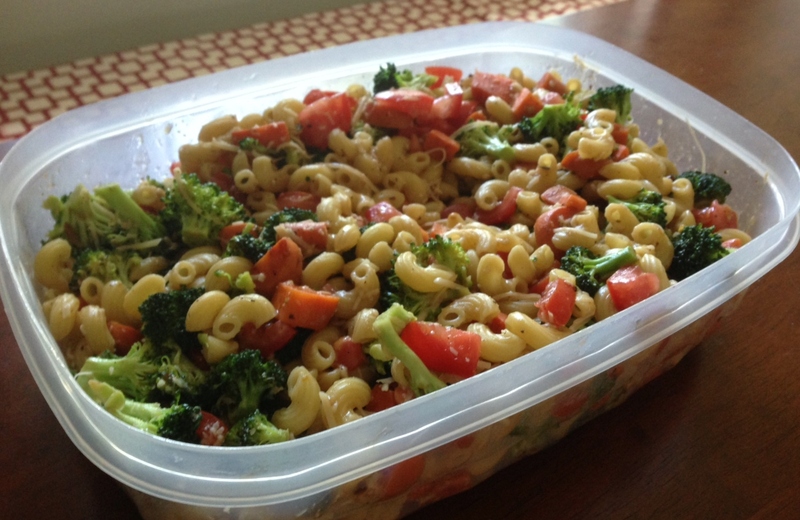 Here is super simple pasta salad recipe for your Labor Day cookout! Prepare pasta. While pasta is cooking, move on the the next step. Heat a little olive oil in a nonstick pan and add onion. Saute until soft. Add carrots and cook for 3-5 minutes. Add remaining vegetables (except tomatoes) and cook for another 3-5 minutes. Remove from heat and stir in tomatoes. Drain water from pasta. Put pasta in a large dish. Add the vegetables and mix well. Add dressing and cheese. Stir to coat and refrigerate for at least 3 hours before serving. More cucumbers. and green beans. and broccoli. and wax beans. Sometimes (well, most times) I am not very creative in the kitchen. I wonder if there is really a point to posting about those times, because to me they don’t seem worthy of discussion. But then I was thinking about how many people don’t realize how simple it can be to whip up something healthy and delicious with random things you have one hand. In all honesty, before the CSA, I could probably count the number of “recipes” I followed for meals this year on one hand, maybe two. Here is an example of one of my no-recipe meals. I served this with grilled steaks and fresh bread. Mix all the vegetables into a large bowl. Add the dressing, starting with 1/2 cup and mix well. It is very easy to use way too much dressing, so start with a little, mix well, and see where it gets you. As you mix, see if there is any pooling at the bottom; if soon, keep mixing! While there may be some dressing at the bottom after the salad sits in the refrigerator for a day or two, it shouldn’t be soaking in the dressing when you first mix it together. Refrigerate for at least 4 hours before serving to help the flavors soak in. It’s that time of year when there are more cucumbers than you know what to do with. We had six in the refrigerator and I wanted something other than sliced cucumbers and pickles. I was going through an old cookbook with loose recipes inside and Cucumber Ranita fell out. I love when that happens. The recipe wasn’t quite what I wanted (cream, whole milk yogurt, spices I didn’t have on hand, etc…), I just used the recipe as an inspiration for this recipe. We served it at a family party a few weeks ago and it was a hit. Prepare the pasta per directions on package. Finely shred 2 of the cucumbers. Mix with the yogurt and cilantro. Add the curry paste and stir well. Quarter the remaining cucumbers. You may want to remove the seeds or use seedless, but regular cucumbers worked just fine for me. Mix the yogurt sauce with the pasta. Add the cucumbers, raisins, and peanuts. Stir well. Serve cold. The past two weeks of CSA have included beets. I had posted I wanted to make Naturally Ella’s Roasted Beet and Carrot Salad both weeks, and we have – it is delicious! And super simple. The pictures in this post are from the first week, when the beets were pretty white. This week the beets were a deep, rich purple. The first time I made this I added some fresh thyme and sliced the carrots and beets. When J made is this past week he chopped everything into chunks and used more pepper. If you are adding spice, be sure to add them at the end of the roasting process – my thyme got an icky burnt flavor. Preheat oven to 450F. Spray a small baking pan with cooking spray. Toss the vegetables and almonds with olive oil. Add to baking pan and season with salt and pepper. Roast for 25-30 minutes, stirring every 10 minutes to prevent burning. Remove from the oven and ix in vinegar. Top with cheese and serve over lettuce or in cabbage cups (use small cabbage leaves. After that corn-filled week, I decided it was time to mix things up a bit. There was no way I was eating corn everyday for the rest of the summer. We had a few ears with dinners during the week, but then I decided to cut the kernels off the cob and use them in a few recipes. I also had a ton of zucchini on hand, which I had shredded up when I made Ambitious Kitchen’s Zucchini Brownies. The brownies only used a cup, so I was left with 3 cups of shredded zucchini. 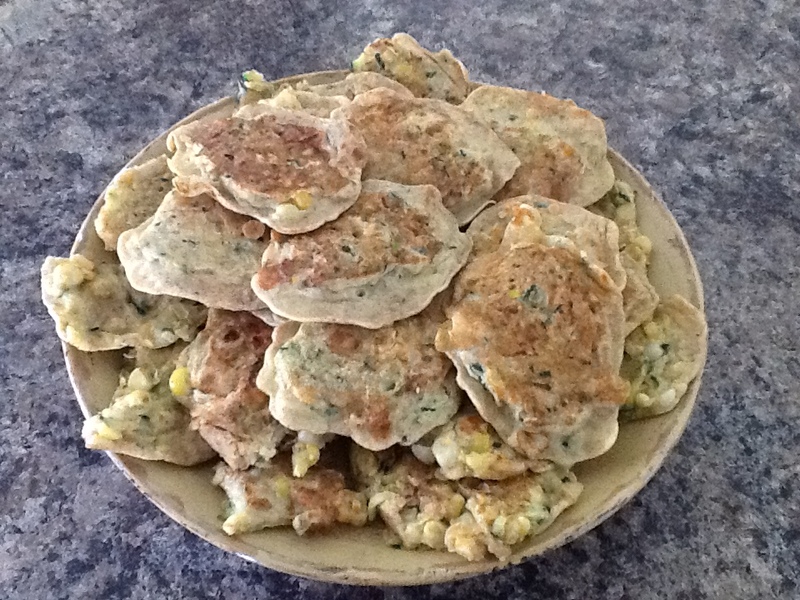 So now I was left with 3 cups of shredded/julienned zucchini and 5 cups of fresh sweet corn. Now what?? First, came a salsa-dip inspired by Smitten Kitchen’s charred corn tacos and zucchini-radish salsa. I didn’t have any radishes on-hand and we were having a cookout in a few days, so I opted for making a dip instead. I will hopefully post that recipe soon. Then came corn and zucchini cakes, inspired by this post on Serious Eats‘ and this post on Whole Foods‘ blogs. I pretty much used serious eats’ recipe as the flavor guide and whole foods’ recipe as the logistical guide. In a large bowl, whisk the eggs, buttermilk, and oil. In a medium bowl, mix the flour, baking powder, salt, and pepper. In a medium bowl, mix the zucchini, corn, pepper, and cilantro. Add the flour mixture to the egg mixture and stir well. 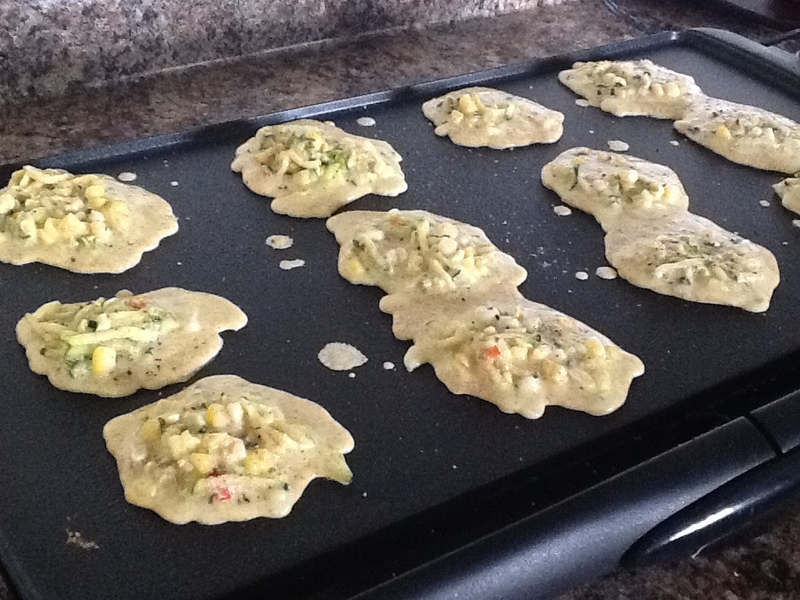 Add the zucchini mixture to the egg-flour mixture and mix well. Serve warm or room-temperature. They are tasty plain, but you could top them with sour cream if you wanted. *I was worried about the centers being done, so I ended up putting the finished cakes back on the griddle once they were all done. We no longer have a griddle so I decided to attempt a baked version. I hadn’t been super happy with the rubbery-texture last time, so I decided I would try a modified recipe. The end result was great – our daughter couldn’t get enough! Mix vegetables together and stir in spices. Whisk eggs in a bowl. Add flour and vegetable mixture, mix well. Use a toothpick to test doness. It should come out clean. Cut into squares. 1. Place the beans lengthwise into a food processor feed tube (I have no idea what this thing is called) and slice thinly. 2. 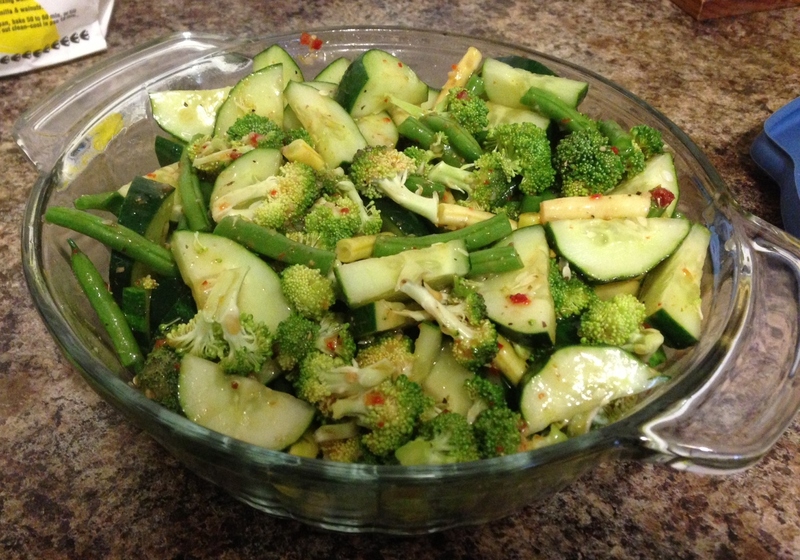 Combine all of the vegetables into a large bowl. 3. In a small bowl, whisk vinegar, sugar, and pepper. Pour over vegetables. Let sit in the refrigerator for at least 1 day before serving. I was really excited when I read the CSA email this week and saw it was cabbage or broccoli. please let it be broccoli, please let it be broccoli. I had my fingers crossed when I walked up to get my box – yes, it contained broccoli. But wait, what that huge thing in the bottom. Oh, it’s cabbage. Don’t get me wrong, I like cabbage. I am just getting sick of it. I can eat it each week, but the problem is one head is SOOO much cabbage. I know, I know, I can freeze it for cabbage soup in the fall. I just needed a moment to be over dramatic. This week’s box also contained beets, which I have had a recent love obsession with. I had been a little sad the last two times because the beets were more golden than red. Not this time – bright red and juicy, leaving my hands stained for the better part of the day. I knew I’d make a slaw with the cabbage, so I did a search to see if there were any cabbage and beet slaw recipes. I had already roasted the beets, which was a bummer once I started to read recipes that called for raw beets. I found a great recipe at The Kitchn that I sounded perfect. I had all the ingredients on hand and it would go well with the shredded beef sandwiches I was making for a trip this weekend. I also found a few recipes I saved for later – a Ukrainian dish called borscht. Turns out the Russian astronauts even take it with them to space (in a tube…I’m sure that’s appetizing). I had never heard of it before, but it looks like something J would love. I found a summer version and a traditional version. Slice beets into matchstick-size pieces. I sliced mine into circles first and then just stacked them to slice them into rectangles. Add cabbage and beets to a large bowl. I used an ice cream tub to make for easy mixing. Whisk vinegar, sugar, and mustard in small bowl. Pour dressing over the cabbage mixture. Mix well. I put the top on the tub and shook it like crazy. Make sure to coat everything. 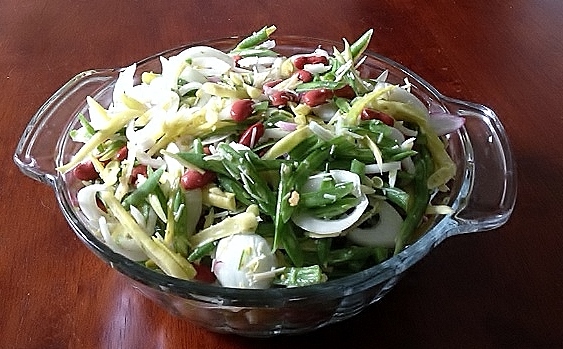 Place slaw in the refrigerator for at least 24 hours before eating. 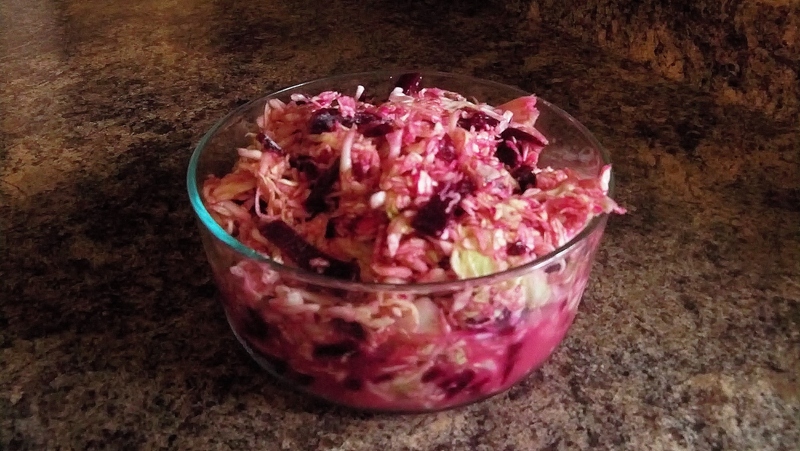 You want the vinegar to have some time to work with the cabbage and give it that awesome slaw flavor. note: the mixture may seem dry at first, but after it sits for a day some liquid from the cabbage will come out and you will have adequate liquid. If it is still dry 1 day later, add some more vinegar. Here is a quick recipe I threw together for a friend’s cookout yesterday. I should rephrase – quick if you have a food processor, but doable if you don’t. I was able to chop all the vegetables in less than 5 minutes with the food processor. If you don’t have time for that, you could by pre-shredded cabbage and broccoli slaw mix at the store. I don’t measure my liquids, so I am guestimating below…feel free to tweak as needed. In a small bowl, whisk the thaini, syrup, and vinegar together. Pour over vegetable mixture and spread throughout. A little goes a long way, so just make sure to coat well.